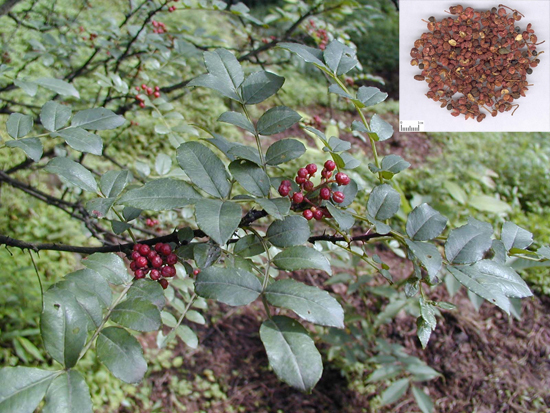 Common Name: Chinese pepper, Prickly ash peel, Zanthoxylum, Sichuan pepper fruit. Fructus Zanthoxyli Bungeani is grown in most provinces in China, but those produced in Sichuan province are of the best quality. Collected in autumn, the fruit is cleaned and used unprepared. Properties & Taste: Pungent, hot and slightly toxic. 1. Yang deficiency of the spleen and stomach manifested as epigastric and abdominal cold pain, vomiting and diarrhea. Prickly ash peel (Huajiao) is used with Pilose asiabell root (Dangshen), Dried ginger (Ganjiang) and Malted barley (Yitang) in the formula Da Jianzhong Tang. 2. Roundworm manifested as abdominal pain and vomiting. Prickly ash peel (Huajiao) is used with Black plum (Wumei), Dried ginger (Ganjiang) and Coptis root (Huanglian) in the formula Wumei Wan. Dosage: 2-5 g, decocted in water for an oral dose. Appropriate quantity for external application.